The 2011 American Eagle Platinum Proof Coin continues a series of strikes that debuted in 1997 featuring annually changing reverse designs. 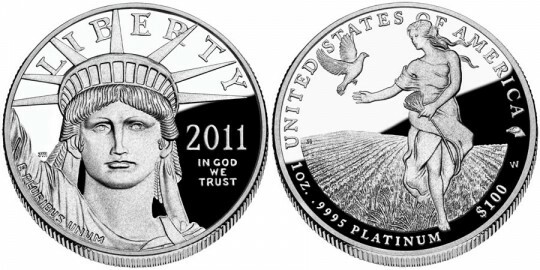 A release date of May 26, 2011 has been indicated by the US Mint for the coin. When initially launched, the Mint produced four different sizes of the .9995 fine platinum coins - one ounce, 1/2 ounce, 1/4 once and 1/10 ounce. However, the fractional sizes were discontinued in late 2008 leaving just the one ounce coin. Reverse designs beginning in 2009 started a new six year series dedicated to the principles found in the Preamble of the Constitution of the United States - To Form a More Perfect Union, To Establish Justice,To Insure Domestic Tranquility,To Provide for the Common Defence,To Promote General Welfare and To Secure the Blessings of Liberty to Ourselves and our Posterity. The 2011 strike will feature a design themed on the “To Insure Domestic Tranquility” principle. An image of the the Statue of Liberty looking "towards the future" is featured on the obverse, as designed by US Mint Sculptor / Engraver John Mercanti. Also shown are the inscriptions "Liberty," "E Pluribus Unum" and the year of mintage. Along with a design emblematic of "To Insure Domestic Tranquility" (one of the six principles found in the Preamble of the US Constitution), the reverse will also show the inscriptions of "United States of America," " 1 oz," ".9995 Platinum" and "$100."